We Diagnose. We Treat. We Teach. We Discover. We are University of Michigan Oral & Maxillofacial Pathology! For over 60 years, the University of Michigan School of Dentistry has been home to the Oral and Maxillofacial Pathology Biopsy Service composed of board-certified faculty members with extensive training in the clinical, radiographic, and histologic interpretation of lesions occurring in the head and neck area including the oral cavity and the jaw bones. Because of our educational focus, our pathologists are able to apply relevant clinicopathologic correlations to help ensure accurate diagnoses and recommendations for disease management based on contemporary standards of care. As members of an academic medical center, we provide you and your patients an oral diagnostic service based on latest research and innovation in health care. Pathological diagnoses are faxed or mailed within 24 hours of soft tissue specimen receipt, with exceptions for hard tissue, special stains, direct immunofluorescence studies and cases sent on consult. We accept most medical insurance carriers and bill the patients directly. We serve the needs of clinicians throughout the United States. We perform direct immunofluorescence studies on specimens where additional testing is needed for a definitive diagnosis of a mucocutaneous disorder such as mucous membrane pemphigoid, erosive lichen planus, or pemphigus vulgaris. Please note that immunofluorescence testing requires the submission of specimens in formalin as well as Michel’s or Zeus solution which is available free of charge, by contacting our service. We are available to discuss patient biopsy results and “next steps” after diagnosis including expedited referral to University of Michigan Oral and Maxillofacial Surgery. For direct patient evaluation and management as well as CBCT interpretation please contact the Dental Faculty Associates. Our five pathologists are Diplomates of the American Board of Oral and Maxillofacial Pathology and provide diagnoses for common and complex oral diseases, including periodontal inflammation, odontogenic lesions, benign and malignant tumors of the oral and maxillofacial region, salivary gland tumors, autoimmune conditions involving the oral cavity, and complex oral manifestation of systemic diseases. Dr. Danciu is a Clinical Associate Professor at the University of Michigan School of Dentistry and a consultant for the VA Ann Arbor Healthcare System. She graduated with a BA in Mathematics from the University of California, Berkeley after which she completed her DMD at Harvard University. She continued her training at Harvard where she obtained a Doctor of Medical Sciences degree as well as a certificate in Oral and Maxillofacial Pathology. After two years as Instructor at Harvard, she joined the University of Michigan in 2007. 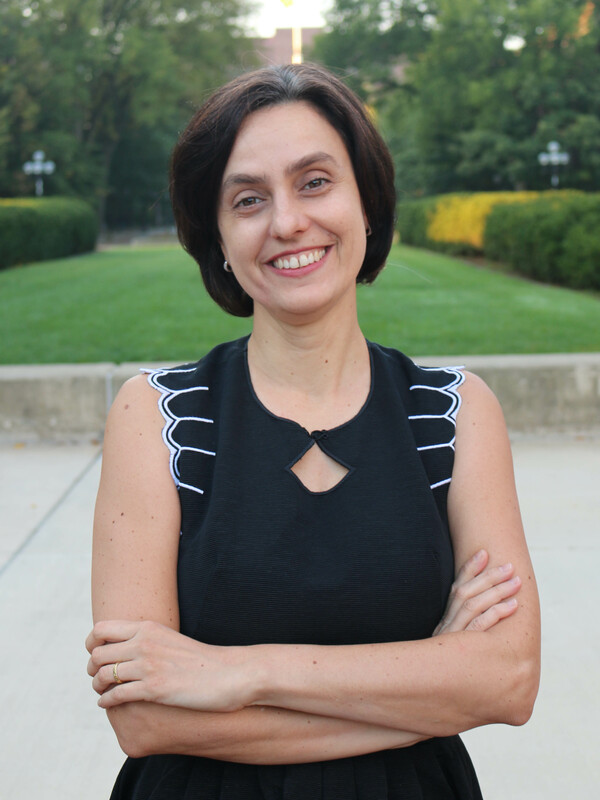 Dr. Danciu is the recipient of numerous teaching awards both at Harvard and University of Michigan and research awards including the National Research Service Award and the National Institute of Health Transition Career Development Award. She currently serves on several committees at the School of Dentistry, American Academy of Oral and Maxillofacial Pathology, American Dental Association and American Association for Dental Research. Dr. D’Silva is an oral pathologist, cancer biologist, and educator. She is Associate Chair in the department of Periodontics and Oral Medicine. Dr. D’Silva is the Donald Kerr Endowed Collegiate Professor of Oral Pathology and Professor of Dentistry at the University of Michigan. 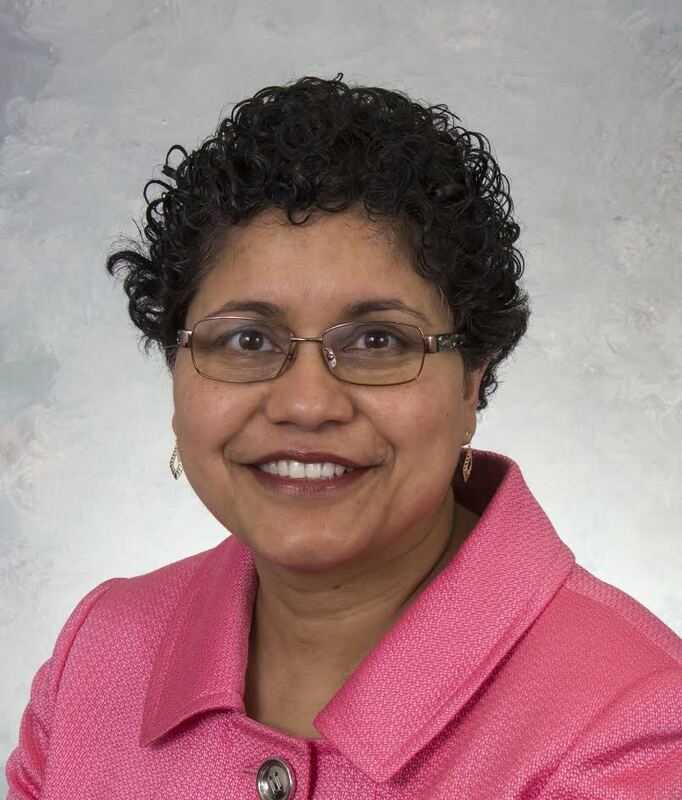 She is also Associate Professor of Pathology at the University of Michigan Medical School and a member of the University of Michigan Comprehensive Cancer Center. Her research in head and neck cancer focuses on biomarkers and molecular mechanisms of tumor progression and treatment resistance. She has published over 70 scientific papers; her research is funded by the National Institutes of Health (NIH). Her work has been recognized by several awards including the Rod Cawson Prize from the International Association of Oral Pathologists and the Royal College of Physicians and Surgeons of Glasgow. She also received the Michigan Institute for Clinical and Health Research Distinguished Clinical and Translational Research Mentor award and the University of Michigan Crosby Award for women in science and engineering. Dr. D’Silva received her dental degree at the University of Bombay, India, followed by a Residency in Oral and Maxillofacial Pathology and a Master’s degree at Indiana University, Indianapolis. She received her PhD at the University of Washington, Seattle. Dr. Lei is an Assistant Professor of Dentistry at the University of Michigan School of Dentistry. He holds joint appointments with the Graduate Program in Immunology, Translational Oncology Program, U-M Comprehensive Cancer Center, the University of Michigan Medical School. He serves on the editorial board of a number of journals, including Oral Surgery Oral Medicine Oral Pathology Oral Radiology. He has also served on the Nomination Committee of the American Academy of Oral and Maxillofacial Pathology. 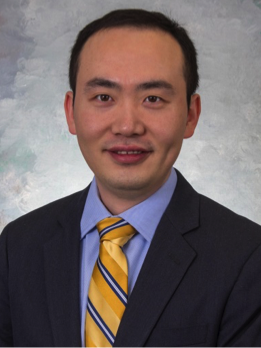 Dr. Lei completed a residency in Oral and Maxillofacial Pathology at the University of Pittsburgh Medical Center (UPMC), following his PhD training at the Lineberger Comprehensive Cancer Center, the University of North Carolina at Chapel Hill. 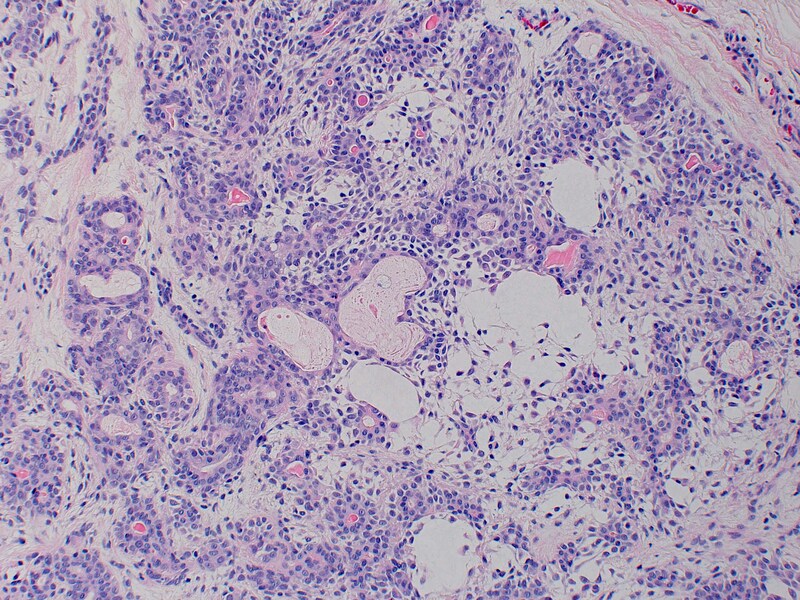 He then completed a Head and Neck Oncology fellowship at the University of Pittsburgh Cancer Institute. Dr. Lei was a Research Assistant Professor at the Department of Otolaryngology, University of Pittsburgh School of Medicine. Dr. Lei is has received well-respected clinical and translational research awards, including the Leon Barnes award for Head and Neck Pathology research from the United States and Canadian Academy of Pathology. He is the principal investigator of a translational immunology research laboratory. 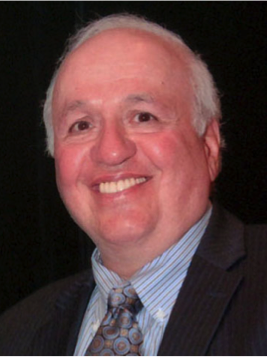 Dr. Polverini is the Jonathan Taft Distinguished University Professor of Dentistry and dean emeritus, University of Michigan Dental School and Professor of Pathology, University of Michigan Medical School. Dr. Polverini holds a bachelor’s degree in biology and a DDS from Marquette University. He completed specialty training in Oral and Maxillofacial Pathology at the Harvard School of Dental Medicine and was awarded the Doctor of Medical Sciences degree from Harvard University. He has held faculty appointments at the University of Pittsburgh, Northwestern University and the University of Minnesota where he served as professor and dean of the School of Dentistry. Dr. Polverini has a distinguished scientific career in the field of vascular and cancer biology where he has long been a leader and influential figure. More recently, he has focused his attention on the educational and workforce implications of new integrated care delivery models and healthcare policy implications of the emerging personalized healthcare environment. Dr. Polverini is a Diplomat of the American Board of Oral and Maxillofacial Pathology, Fellow of the American Academy of Oral and Maxillofacial Pathology, and a Fellow of the American Association for the Advancement of Sciences. He is a recipient of the Distinguished Scientist Award in Oral Medicine and Pathology from the International Association for Dental Research, the Birnberg Research Medal Award for Excellence in Dental Research from Columbia University College of Dental Medicine, the Distinguished Alumnus Award from Marquette University School of Dentistry, the William J Gies Award for Vision by a Dental Educator from the American Dental Education Association Gies Foundation, and past President of the American Association for Dental Research. Dr. Polverini is an elected member of the National Academy of Medicine. To submit a specimen, please download a biopsy submission form. We provide free of charge, UPS prepaid 2-day shipping labels and biopsy service kits. Our kits have biopsy submission containers with formalin solution and, upon request, Zeus/Michel's solution for specimens requiring direct immunofluorescence studies. You can drop your UPS package off at UPS drop box location or have your regularly scheduled UPS driver take the package or call 1-800-PICK-UPS (1-800-742-5877) to schedule a pickup at your office. Collection and Handling: Specimens should be procured using accepted surgical techniques. Because of the small size of most oral specimens it is especially important to avoid inducing crushing artifact through the injudicious use of clamps or forceps. Placement of a suture in the specimen prior to removal will allow for handling without damage. Use of electrosurgical instruments for the removal of small, delicate specimens should be avoided because of the possibility of heat damage and distortion. In some cases, physical damage to a critical area of a specimen may render it inadequate for diagnosis and a comment to that affect will be made in the pathology report. Labeling: Specimen containers and lab requisitions must be labeled with the full name of the patient and the submitting doctor and date the specimen was collected. If an improperly labeled specimen is received by the laboratory, a reasonable attempt will be made to confirm its identification. To expedite service, all pertinent areas of the lab requisition should be completed. If some information is not available, please state this on the requisition. Inadequately identified specimens will not be accepted for processing. Fixation: Specimens should be fixed in the buffered formalin solution supplied free of charge, by our laboratory. Specimen volume should not exceed 10% of the fixative volume. Larger specimens should be divided and submitted in multiple containers. 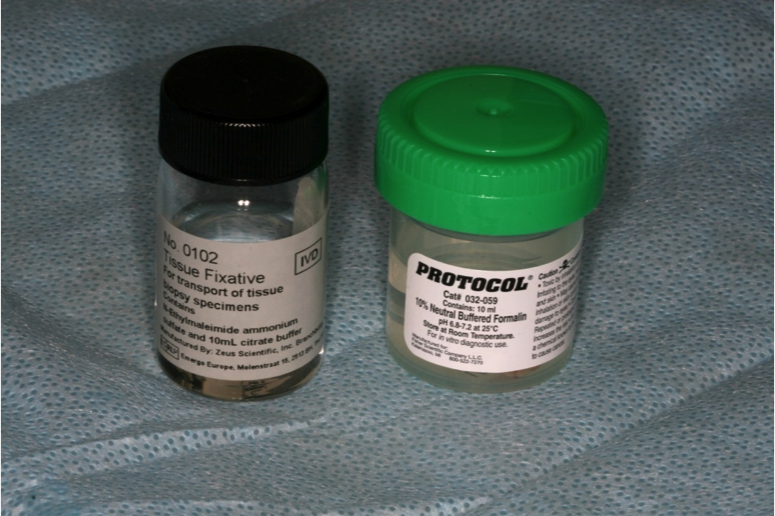 Over time the fixative may evaporate from stored specimen containers. These should be discarded or returned to this laboratory for refilling, because the fixative cannot be reconstituted. Biopsy kits, which include UPS prepaid shipping labels, lab packs, specimen bottles with fixative, and lab requisition forms are available free of charge. Transportation: Transportation of your specimen using your UPS prepaid mailing label and lab packs is the preferred way to send your specimens. You can call UPS to arrange pickup of your specimen or place them it a UPS drop box. Specimens may also be sent to us using US mail but this can delay the delivery of your package and the possibility of it being lost in the mail without any tracking capability. Specimens can also be hand-carried to the laboratory. Please call 1-800-358-1011 to coordinate hand delivery if you or your patient would like drop off a specimen. Please use our 2-day UPS label & lab pack for sending your specimen to us. Specimens sent during the winter months (December through March): The following procedure should be used in order to avoid freeze damage to specimens in transit to the laboratory. Fix specimen in formalin solution for 24 hours. Decant formalin and replace with 70% alcohol prior to mailing. Ethyl alcohol is preferred but methyl alcohol or isopropyl alcohol is acceptable following formalin fixation. Please note, formalin is a hazardous waste and must be handled as such. Adherence to the above procedures will insure expeditious handling and optimum quality of biopsy specimens. We look forward to serving you and your patients. For questions regarding your bill please call APS Medical Billing at 1-800-594-1876. To pay your bill using a credit card please call 734-647-4246.